For my shooting star wherever you are... @agnes.varda ?? I seriously doubt that Agnes Varda ever followed in anyone else’s footsteps, in any corner of her life or her art…which were one in the same. She charted and walked her own path each step of the way, she and her camera. Every single one of her remarkable handmade pictures, so beautifully balanced between documentary and fiction, is like no one else’s?every image, every cut… What a body of work she left behind: movies big and small, playful and tough, generous and solitary, lyrical and unflinching…and alive. I saw her for the last time a couple of months ago. She knew that she didn’t have much longer, and she made every second count: she didn’t want to miss a thing. I feel so lucky to have known her. And to all young filmmakers: you need to watch Agnes Varda’s pictures. Rest in price Agnes. She was the filmmaker of my life. Kung Fu Master was the movie that propelled me to make Me and You and Everyone We Know and her life was the one that most inspired me ? married to another director, having children but always her weird self and always making things that were actual, spirit-filled art, not movies in the boring sense. This isn’t very well written and I am tearful. It was incredibly sweet and meaningful to me that our lives overlapped at the end. That I got to sit in her home in Paris and eat the food she made, that my child jumped on her grandchildren’s trampoline here in LA, that she wrote funny things on my videos, calling me a kook, as if she weren’t one. The whole time I was making this new movie I thought “I can’t wait to show it to Agnes.” It’s a small, selfish thought, but these are the things that help one through the long process. Just to not feel alone. I am indebted to you and forever grateful. Ok, goodbye. You did so good. Thank you. * * photo by @dianawpicasso who was with us that day. 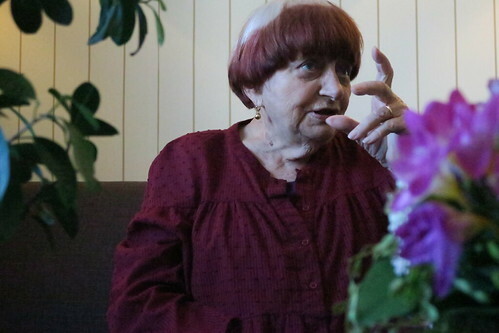 On this day in 2013, Agnes Varda told me she just couldn’t stop making things, that she wrote every morning starting at 4am. She showed me a notebook full of drawings of possible props and then she finished the leftover drinks on all the tables around us. It was her idea to pound it out. Rest in power to the best ever to do it. This is Agnes Varda at the Foundation Cartier in Paris, 2008. All who delighted in her flexible mind, her curiosity, boundless energy and impish smile mourn her passing. Her films and visual work have provoked and inspired generations of filmmakers and artists. Always independent, a singular being, following no particular creed, nor rules. She simply did what was right, yet also entirely unexpected. All shall miss you Agnes. Once you created a perfect mound of salt. I stood before it for hours and felt the whole of history. Farewell Farewell Agnes. Ten thousand years. Ten thousand pennies for for your thoughts. 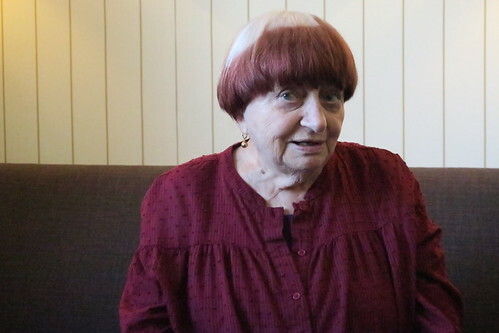 Agnes Varda loved Cinema and was loved by Cinema in return. Sharing a few beautiful moments with her- in which she was recognized as the powerhouse she was- was a highlight of my life. The youngest soul I have ever met. RIP Agnes Varda, a icon of independent cinema before it even had that name. 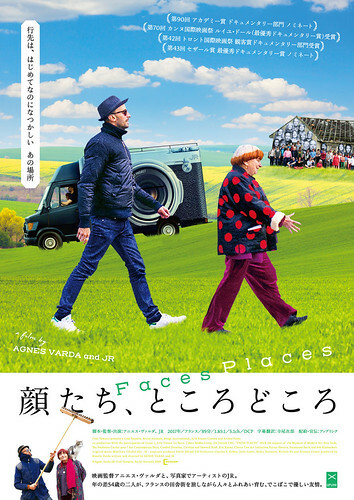 'Faces Places' was an inventive, funny capper on an extraordinary career. Was funny to see her, smiling with bemusement, on the 2017 Oscar circuit. She didn't need one. She was already a legend.